In keeping with Mustang Survival’s commitment to the highest level of quality and safety, we are notifying the public of an urgent recall advisory relating to certain inflatable Rescue Sticks™. The affected Rescue Sticks™ may not achieve the desired inflation pressure when activated. To determine if you are impacted by this advisory please reference the instructions below. This advisory is for the Mustang Survival MRD100 & MRD101 Rescue Sticks™, as well as our Rescue Kits which contain a Rescue Stick™. The Rescue Kits are identified as models MRK110, MRK120 [discontinued] and MRK130 [discontinued]. The re-arm kit for the Rescue Stick™ (identified as model MA7206) is not affected by this issue and not part of this recall advisory. If you see a yellow dot on the end of the CO2 handle, your Rescue Stick contains a good CO2 cylinder handle assembly, is not part of this recall, and is OK to use. If no yellow dot is present, proceed to Step 2 below. 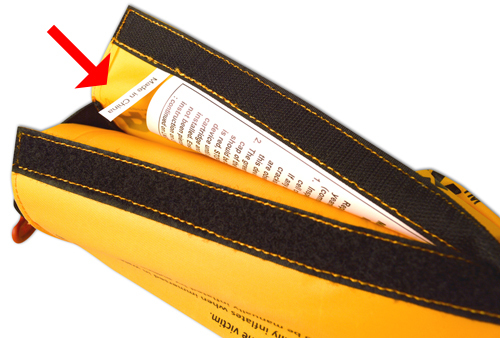 Check the small “Made in _____” label on the inside of the Rescue Stick fabric cover (see image 2). Note: You only need to open the outer cover enough to visually inspect the label. You do not need to completely unpack the Rescue Stick. If label indicates Made in Canada or Made in USA, your Rescue Stick contains a good CO2 cylinder handle assembly, is OK to use, and is not part of this recall even if it does not have a yellow dot on the handle end. If the label indicates any other country than USA or Canada, AND the handle does not have a yellow dot, proceed to step 3. You will be supplied with a new rearm kit, free of charge, containing a new CO2 cylinder handle assembly for each of your affected Rescue Sticks. You will not need to return your product to Mustang Survival. Prior to installing your new rearm kit, manually inflate the Rescue Stick using your current CO2 cylinder handle assembly (by pulling the red “Jerk To Inflate” tab) to ensure that it is emptied and can’t be used in future. Next, re-arm the Rescue Stick and re-pack it according to the instructions in the video below or in your owner's manual (located in the 'specifications' tab on the mrd100 & mrd101 product pages). A. Part of the assembly process for the throw handle (which contains the CO2 gas cylinder) is preventing the cylinder from properly seating against the inflator mechanism and creating an airtight seal. This may result in some CO2 not properly entering the inflation bladder and preventing the bladder from reaching the desired inflation pressure. Q. Is the product dangerous to use as-is? A. No, there is no danger to the user, however there is a risk that the device may not reach full inflation pressure and not perform as expected. Q. How did Mustang Survival find out about this problem? A. This problem was discovered by Mustang Survival personnel during demonstrations. There have been no reports of any issues from consumers or agencies. Q. Is every Rescue Stick affected? A. No, if the Rescue Stick was manufactured in Canada or in the USA, the product is OK. Check the small label on the inside of the outer cover of the rescue stick for country of manufacture. Q. Is any other Mustang Survival product impacted? A. No, the unique component that needs to be replaced on the Rescue Stick is not used on any other product. Q. How do I get mine fixed? A. Please read the advisory notice on the Mustang Survival Website and contact Mustang Survival Customer Service at 1-800-526-0532. A replacement handle/CO2 cylinder assembly will be sent to you at no charge. Upon receipt of the replacement handle, immediately replace your old handle with the new one. Q. How long until I receive my re-arm kit? A. Please contact our Customer Service group and they will arrange for your re-arm kit. As these will need to ship by ground due to the CO2 cylinder, it may take up to 2 weeks for you to receive your replacement. Q. Can I throw my old handle in the garbage? A. No. A charged CO2 cylinder can be dangerous. If your product is affected by the recall, please manually trigger inflation of your Rescue Stick before re-arming the device. This will empty the CO2 cylinder and render it both safe for disposal and unusable to avoid accidental use in the future. The Rescue Stick inflation can be triggered by pulling the “Jerk to Inflate” tab. 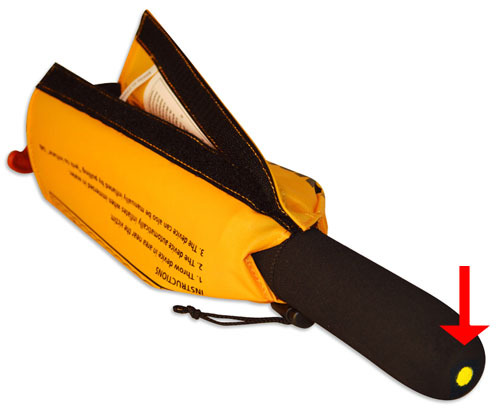 You will be required to re-arm and re-pack the Rescue Stick by following the instructions in the Owner’s Manual prior to resuming use of the device. A video of the re-arming process is available at above. Q. Help! The handle is spinning and the cylinder will not unthread from the inflator. A. Grab the foam handle securely with a pair of slip jaw pliers or vicegrips and gently turn the handle assembly counter clockwise relative to the inflator. This will damage the foam handle but will help remove the cylinder. If the problem persists, please contact Mustang Survival for assistance.